Ratch flip up shield, available in clear and smoke. Shield fits nicely on the helmet. Provides good wind protection. Q: What manufacture of helmets will this fit? A: Yes, this universal 3 snap shield will fit the Shoei Half helmet. The Shield has adjustable snaps so it fit most all models that have 3 snaps across the front. Q: Is this visor suitable to my thh t380 model? 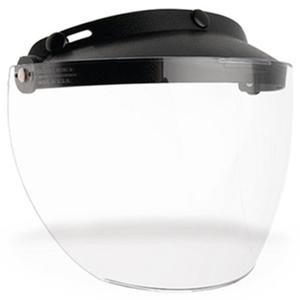 A: Yes you should have no issues snapping a 3 snap visor on your helmet, shields with 3 snaps will fit any adult helmet with 3 snaps across the top.